Yellow labs can suffer from allergies. Your sweet tempered, mild-mannered yellow Labrador retriever loves physical attention, including regular brushing and grooming. This is good news, because he's also prone to a number of skin conditions. Having regular physical contact with your pup will help you identify skin issues before they get uncomfortable. 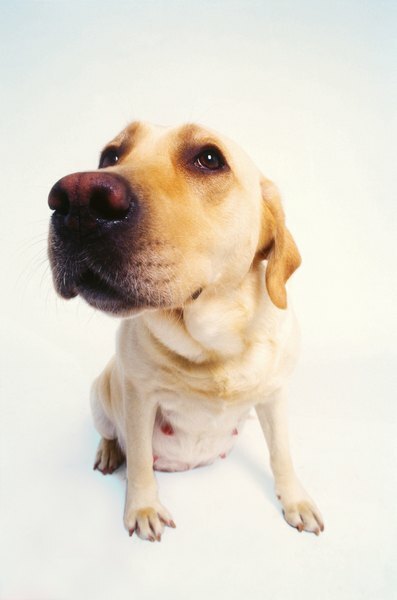 Yellow Labs are subject to a variety of skin allergies, which are triggered by various irritants. Environmental factors like pollen, a poor diet or contact with chemicals like pesticides or herbicides can irritate your pup’s skin. You might see bare spots, a prickly rash or even crusted-over scabs from scratching. Take your Lab to the vet. He might need an oral allergy medication as well as a topical anti-itch, anti-inflammatory cream to combat scratching. Even though yellow Labs have an oily double coat, they’re prone to dry skin if that oily coat is stripped away through too much bathing. Yellow Labs really only need a shampoo bath a couple of times a year. If your dog is regularly in the mud or you feel compelled to bathe him more frequently, talk to your vet about adding an essential oil or a moisturizing conditioner to the regime to help ward off dry skin problems. If your Lab gets a bug bite or scratch and it bothers him, he may bite and chew at it until he develops a wet open sore, commonly known as a hot spot because it can be warm to the touch. Luckily, your Lab’s light coat makes this easy to identify before it gets out of hand. A hot spot is typically treated by shaving a little bit of the hair away from the sore, cleaning it with an antibacterial soap and allowing it to dry. If your dog is an ambitious chewer, he may need an Elizabethan collar to keep him from the wound until it heals. Yellow Labs, especially very light-colored varieties, can be prone to sunburn if they’re out in harsh sunlight for too long. Talk to your vet about an appropriate sun block for your pup and apply it whenever he’s outside for extended periods of time. Pay close attention to your pup’s pale underbelly, which is especially susceptible to burns. If your yellow Lab is outside a lot, he could develop cracked skin on his paw pads. This is especially true for Labs trained for hunting and who are out in the woods, on rocky terrain or in and out of water in all weather conditions. Cover your dog’s pads with booties or wipe them off if your pup has been out in the snow or on hot pavement. If you see cracked or rough pads, apply a thin layer of petroleum jelly to help restore moisture. What Can You Use to Brush Your Cat's Teeth? What Makes Poodles Lose Their Fur?